Sophia was diagnosed with Neuroblastoma with Opsoclonus Myoclonus Syndrome when she was just 20 months old. In the Spring of 2006, at 15 months old, Sophia started stumbling over her own feet and falling down. At first, we passed it off as new shoes, toddlers clumsiness, even seasonal allergies, thinking it would pass. It didn’t pass and continued to worsen. A visit to the pediatrician led us to a neurologist, fearing a brain tumor. Scans cleared her head, but didn’t solve the mystery of Sophia’s walk, and new rapid eye movements. After months of trying one thing or another, physical and occupational therapy, wearing helmut, getting fitted for leg braces and even considering a walker, we were still no closer to understanding why Sophia was so unstable. Our neurologist asked if she could consult with a colleague at Georgetown University Hospital, an oncologist. A terrifying thought, but we were desperate to understand what was happening to our little girl and what it would mean for her future. After more tests and scans – this time of her abdomen – Sophia was diagnosed with Neuroblastoma with Opsoclonus Myoclonus Syndrome (OMS). OMS is a rare disorder referred to as friendly fire, where Sophia’s own immune system was attacking her cerebellum in response to the tumor. 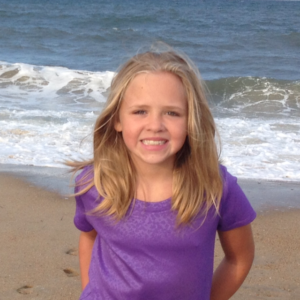 After several surgeries and two rounds of chemo, Sophia was declared NED – no evidence of disease – in February 2007. Today Sophia is happy, healthy and thriving. She still has some battles to bear, but she greets each new challenge, either medically or in general life, with a strong spirit and great determination. She looks forward to racing in JUST TRYAN IT each year, to enlisting friends to join her, and to somehow help others through her story and her spirit!